Your first line here was hilarious! They cook, they don’t eat, but you do. Temptations! Maybe you need to get them sharing with neighbors, for your sake?! A win win for almost everyone, maybe? Great that they are in the kitchen making stuff no matter what. I loved your genes and strawberry post, and others too. It looks like you are doping great things there at your house! Thanks much Kerry, neighbours ars already fed as well 😉 They’re very happy. Seems I really need to learn to resist temptations. That is always the problem with my kids. I’m a sucker for easy recipes ;). My kindergarten kiddos would love these! Please ship me enough for a classroom full of 5yr olds! I love Kellogs! I should do this for my nieces and nephews when I visit them later in the year! Hello good to come by your blog. Thank you for reading mine…. Amazing how much fun, mileage, and nostalgia we can get out of certain cereals. 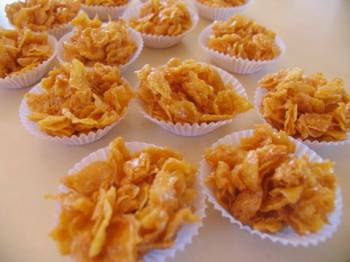 Corn flakes in deserts, or as part of a stuffing recipe. Then there are those crucnchie Rice Krispies marshmallow treats, piled high on a plate, waiting for you to get home from school. Or the oh so simple Cherrios, or Fruit Loops in a plastic container as munchy foods for the toddler in the carriage. Glancing at a parent and child across a subway car, or rewinding the tape of my life — the images are there — and somehow comforting. I’ll share these with granddaughters this summer. Thanks for the ideas. This is fun to have and sounds yummy! I have grandkids like Gail just said…your posts are very well organized and thoughtful.